By preaching Wycliffé s ideas in Czech and not in Latin, Hus offered a nationalist and reformist opinion to the audiences who attended the Bethlehem Chapel in Prague. He attacked indulgence, the clergy’s greed and other misuses of the power of the church, and he was very critical of the frequently horrible conditions that the peasants were forced to live in. Hus’s preference for the Czech dialect and literary works caused divisions. 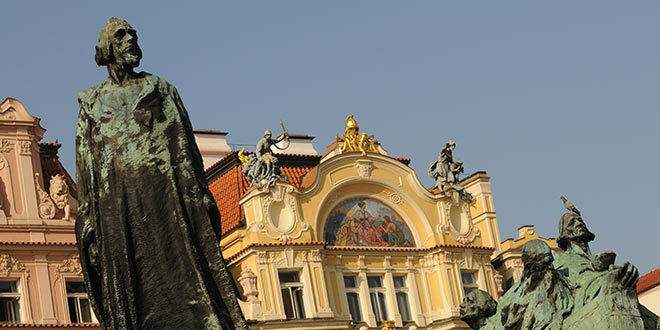 Teachers and students who spoke German, that were the majority in the university, departed from Prague to Leipzig to set-up a new university in 1409. The clergy authorities quickly fell out with him; in 1410 they ostracised him and forbade him from preaching. 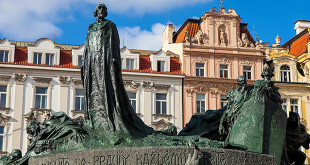 At first, he received support from King Václav the fourth but, in1413, his criticism of the selling of indulgences to finance papal wars angered the king, who was a beneficiary of this practice. Hus wisely moved to the south of Bohemia where he wrote religious literature and communicated his philosophies across the country-side. He was arrested, under a safe conduct assurance, while on his way to the Constance Council and burned at the stake on 6th July 1415. Many of the ideas most closely linked to Hus were communicated only after he was executed. The main concept of Hussitism is the requirement to conduct both types of communion (sub utraque specie), where the congregation would get wine and bread, as opposed the Catholic tradition, at the time, of providing only wine to the clergy. In 1419, King Václav permitted Hussite’s opponents to go back to their parishes, however riots erupted and finished in the 1st Defenestration. Several weeks after this, the pope started a crusade opposing the Hussitcs. The movement of the Hussite’s wasn’t united. The moderate followers, called the Utraquists, were basically religious reformers. The more extreme Taborites, who associated religious and social reform with each other, believed in the ending of class distinctions all together. The Taborites made violent attacks on the Catholic’s clergy and property and on the influential classes of the German merchants. Initially, they were very successful. With the charismatic figure Jan Žižka leading them, the Taborites enjoyed massive support from poor peasants in Moravia and Bohemia and easily beat the Catholics. The Vatican conceded to the Utraquists, in 1433, at the Council of Basel, to allow both types of communion but this was not enough of a concession for the Taborites. They carried on fighting, but were eventually beaten in 1434 in the Battle of Lipany because they couldn’t contend with the combined mite of the Catholics and the Utraquists. In modern times, the Hussite Church (founded in 1920) promotes female ordination and a priest’s right to marry.